The Japanese people started immigrating to Brazil in the early 1900’s. After landing in Santos, a port city, they first headed to the countryside crops in the states of São Paulo and Paraná. Throughout the decades, they have spread to different areas in the Brazilian territory, building up communities in the seaside of São Paulo, the Amazonian region as well as in cities in the state of Rio de Janeiro. Their importance to the development of Brazilian agriculture was fundamental, by developing the growing of vegetables, fruits and flower, amongst others. In the second half of the 20th century, the food items produced by the Japanese communities played a strategic role in the country’s food supply, as the country was undergoing a process of urbanization. In the state of Rio de Janeiro, the communities of Baixada Fluminense (Santa Cruz, Nilópolis and Itaguaí), Petrópolis, Nova Friburgo, Angra dos Reis and Rio de Janeiro capital are prominent. There are notorious cases such the one of Nova Friburgo, where the Japanese launched and developed the growing of persimmon and flowers, sharing their knowledge with other farmers of the region, regardless of their nationality. In the city of Angra dos Reis, the Japanese immigrants played an important role in the fishing industry, building factories for the processing of sardines in many areas of Ilha Grande Bay. Located in Angra dos Reis, south seaside of the state of Rio de Janeiro, Ilha Grande is currently one of the country’s main tourist destinations. Far from the continent, the access to the island is done by sea. With a territory of 192 km² and four unities of safeguarded nature, nowadays, the place holds a population of about six thousand people. Visitors from different parts of Brazil and the world reach for the beaches, forests and calm waters of the island. In the past, Ilha Grande was inhabited by the tupinamba indigenous people. In the 17th and 18th centuries, the island was the stronghold of pirate ships and in the 19th century, it had coffee and sugar cane plantations. In the 20th century, the economy was based on the the production of bananas, agriculture and fishing for subsistence. In those times, the Japanese immigrants began to settle down in the many villages of the region. 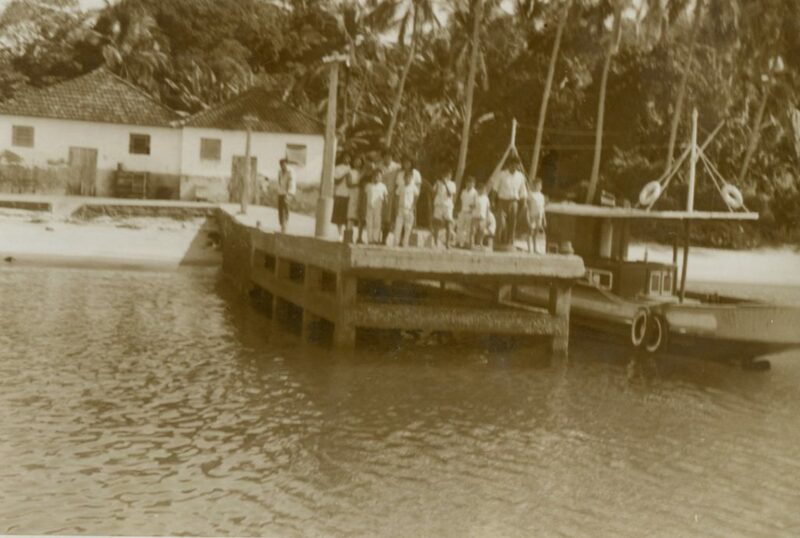 Arising from other states in Brazil, mainly São Paulo, in search of new opportunities, these families foresaw the vast potential of fishing in Angra dos Reis sea, and were the main actors of the most important economic cycle of Ilha Grande in that period – the processing of fish. Sardines were abundant and became the main source of their business. Industries, known as “sardine factories”, spread throughout the city. Their main product were the canned salted sardines, whose larger consumer market was located in the Northeast region of the country. Greek, Portuguese and English families were proprietors of industries in the continent and in Abraao’s Village, but the Japanese and their descendants held the vast majority of this business. Dozens of oriental industries had spread throughout Ilha Grande and Ilha da Gipóia. The beaches of Japariz, Freguesia de Santana, Bananal, Matariz, Passaterra, Magariqueçaba, Ubatubinha, Longa, Araçatibinha, Vermelha, Camiranga, Armação and Fazenda held at least one of these factories. At the Bananal beach, for instance, six industries ran operations. The industries of Ilha Grande used a family-oriented model, in both their administration and work. Nipponic families were numerous. Leadership was held by the patriarch together with the eldest son. Other members of the family geared to different businesses or places, after marriage. It was in this way of living that the cores of the Hadama family settled down in Bananal, Praia Vermelha and in the continent of Angra. The same happened to the Uehara family, which divided itself throughout the beaches of Passaterra, Ubatubinha, Araçatibinha and Ilha da Gipóia. This activity had an impact not only in the landscape, but also in the social and economic dynamics of the caiçara villages of Ilha Grande. Relying on the sea’s feedstock, the facilities for processing food were built near the sand strip of the beach. Piers were also built to guarantee the fish’s arrival and the later flow of the processed product. Many of the current structures of boarding and landing of Ilha Grande had their origin during that period. The caiçaras played an important role at the Japanese industries as well. Little by little, the routine of these populations, originally centered in the agricultural practice in island’s interior or “wilderness”, was slowly geared towards the sea. The caiçaras worked together with the Japanese in dry-salting sardines. Ms. Carmen Tenório relates some episodes of the beginning of this activity at Bananal Beach. In that time, without electricity and refrigeration, it was necessary to manipulate the fish immediately after landing. The fishing boats had no scheduled time to arrive. The sardines were captured and immediately taken to some factory in the area, even at nighttime. Ms. Tenório tells that, in those occasions, the old Higa climbed up the hill with his Belgian lamp to call each worker in his or her house. As he went on, he was followed by the people who had heard his call and who also used lamps or bamboo torches to light up the way. It was like a procession. Once they had reached the beach, they organized a circle with the torches and the workers gathered for the first phase of cleaning the fish. Tião, Ms. Tenório’s husband, said that at that moment many lights crossed the sky. Despite employing a significative number of workers, the Japanese-owned fishing industry at Ilha Grande was categorized as a family business. The Kamome factory, at Matariz Beach, was an exception, though. Owned by Mr. Hiruta, Kamome was bought in the 60’s by one of its employees, Kunji Odaka. Mr. Odaka turned Kamome into the greatest and most successful industry of dry-salt sardines in the city. By adopting a process of almost using up all the fish, in addition to the dry-salt sardines, Kamome also produced fish flour using the fish rejected for dry salting. The fish flour, by its turn, created two residues – water and fish oil. The oil was sold to chemical industries. Between the 70’s and the 80’s, the Kamome employed approximately 150 people. It was the last sardines’ factory to be shut down in the city, in 1994. It was in this simple and eloquent manner that Mr. Odaka related the day in which he landed in Brazil in the year of 1955. Whoever observes the life path of the Japanese immigrants may not pay enough attention to the challenges this individuals faced in adapting to a new home. Away from his family, alone, Kunji Odaka worked in different farms in Brazil until he finally settled down at Matariz beach, Ilha Grande. He then got married, had three children and became a Brazilian citizen. However, the sadness and loneliness of those first moments in a country whose natural and cultural references were opposed to the ones of his homeland have echoed in his memories up until today. Among the many estrangements experienced by the Nipponic immigrants, eating habits were one of the most vividly felt. To soften the lack of some foods on their diets, these groups started to produce what was not available on Brazilian soil. Additionally to starting cultivating fruit and vegetables, the Japanese also dedicated themselves to produce important processed food for their meals, such as soy sauce and tofu. The production, at first targeted to domestic consumption, eventually spread to other Japanese communities. Nowadays, in the Brazilian food market, there are some well-known oriental food industries, which began with this handmade production for the community. At Ilha Grande, the Japanese dedicated their work to the processing of fish. As mentioned above, dry-salt sardines was the main product of these sales, targeted to Brazilian consumers at a time when refrigerators were not common in the country’s households. Nevertheless, additionally to the dry salting process, the Japanese and their descendants prepared a spice, unknown to locals, but appreciated by the Nipponic communities of São Paulo and Paraná – the dashico, also known as niboshi or iriko. The dashico is a smoked dry fish, used as a spice, mainly to make broths and soups such as missoshiro. At the Ilha Grande, the product used for this preparation was the sardine. The dashico was the first product made by the fishing industries of Ilha Grande. The artisan technique of preparing the spice enabled the Japanese to raise enough money to build the facilities of the factories. Smoked sardines did not need complex facilities, they could be prepared on fire-based stoves, fueled by firewood, and bamboo mats for sun drying. The handmade technique for producing the dashico from Ilha Grande’s Japanese community is simple, but very meticulous. Mr. Tarumassa Tonaki and Ms. Tsuruco Nakamura produced many dried fish during their youth. Now, at the age of 90, Mr. Taru still lives at Matariz Beach, the place where he raised the Crescente Factory together with his partner Kikuiche Iha. During the working of the factory and especially after its closure, he produced thousands of dashico boxes, which were traded in São Paulo. The money he earned from selling this product financed his son’s college education. Washing, removal of the head and innards. Cooking is quick. In times where there was no tap water, this step was made with seawater. The only reason why cooking before smoking was done was due to the great amount of fish manipulated. For smaller quantities, it is better to skip the cooking step and go straight to the smoking part. By doing this, the flavor is sharpened. Smoking was made in stoves fueled by firewood. A kind of “little house” was built, with shelves on the right and left side, where boards with sardines fit in. In the middle of this structure, fire, which burned constantly and mildly for a whole day, was lit up. The heat and confinement of the stove made the even smoking of the fish possible. When domestic production ocurred, with improvised methods being used, it was necessary to make sure that all sides of the fish were smoked. Depending on the position of the sardines’ board and of the fire, the fish needed to be turned, its position changed to ensure thorough smoking. After the long smoking process, the fish laid in the sunlight for about three days. Suspended grids were the base for dozens of boards made from bamboo. Throughout this step, the fish was turned to receive sunlight equally. The last step consisted of scraping the surface of the fish. The fish was, then, placed in boxes and sold in São Paulo to the Japanese and their descendants. Ms. Tsuruco was married for many years to Mr. Odaka. She also worked with him in the Kamome factory. The production of dashico, however, was her exclusive task. She dedicated herself to this artisan work. Sometimes, her children helped her in small tasks. One of her daughters, Hiroko Odaka, remembers that she used to spend her school vacations turning the board of dashico. It was also Ms. Tsuruco who carried the merchandise to São Paulo at the roof rack of a common line bus, to offer the dashico at the Cantareira Market. The growth of urbanization and the new dynamics of the country drove a great part of the Japanese immigrants, proprietors or tenants of small amounts of land to the big city. At the urban centres, they dedicated themselves to other economic activities, and, consequently, the link of these groups to land and fishing diminished gradually. Nowadays, one can rarely find someone who knows how to prepare dashico. Despite of being a highly appreciated product, the time needed to prepare dashico diverges from the pace of contemporary life. For the documentary shooting, we have remade each step of dashico’s preparation, together with Mr. Taru. During this process, we have realized many things. It is not only about following the steps of preparation, smoking and drying of the fish. One has to know the exact intensity of the fire and the right time of exposure. We need to abandon the gas stove, burn the firewood and wait. We need to observe the fire for long hours. This is the time when we reconnect with the essential energy of the elements. The secular time merges inside nature’s own time. And, in this step, the concept of space becomes abstract. A great deal of the Japanese of Ilha Grande were born in another island – Okinawa, in Japan, which is in many aspects similar to the Brazilian island. The relation of this community to the sea is, therefore, centennial. For this Japanese community, the time of making the dashico was also the time to deal with the sea and manipulate the richness that the waters always provided to their people. It was when they brought the flavors of the motherland to the new land, using the products and fruit of their new home. Chronological time and the pace of modern life inflict on the human being the forgetting of his or her inner self. Without access to the deepest experiences, human capacity to transformation is restricted. That is why when we arrive at Ilha Grande and see Mr. Taruo cultivating the garden, putting the fishing basket, drying the squids; smoking the fish… we realize that the rush of the city does not do us any good. The people’s tradition of making of things have a ritual character, for their making has been repeated over the generations. When we set ourselves to retake these practices, we began perceiving life in its totality. The ritual goes beyond the partial reality of the present; the ritual gathers the knowledge of an era and the experience of all the others who repeated that action. Tradition, therefore, is not a synonym of anachronism and immutability. On the contrary, it is the driving energy of transformation, as it makes us travel through different times. Japanese traditional culture brings the rite to each moment of its routine. It assumes an attitude of devotion to the day-to-day. Such devotion is expressed in the aesthetical care to common activities such as writing, represented by the shodo technique (caligraphy), and in the making of domestic tools, such as ceramic or even at the patient dedication needed to reach the sharpest flavor of dashico. By doing so, we touch perfection.